Rob Cesternino and Akiva Wienerkur want to be pirates, but also want to bring you the most extensive recap of each Seinfeld episode each week. 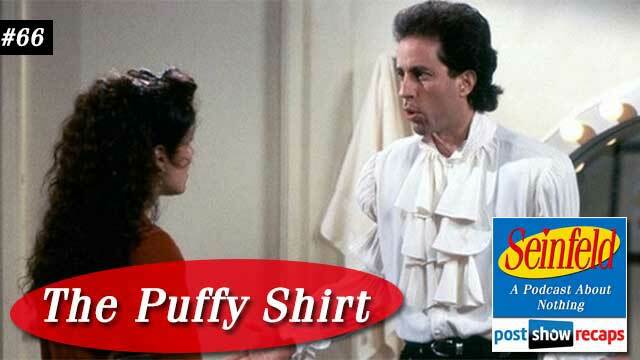 This week they breakdown “The Puffy Shirt”, the second episode of season five, which first aired September 23, 1993 and was written by the Larry David. 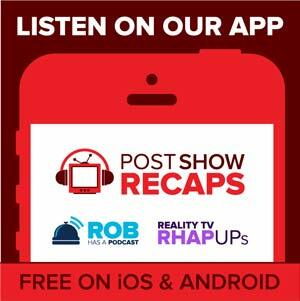 Forgoing Seinfeld news, Akiva and Rob jump right into the recap. Jerry’s opening stand-up is a bit about moving back in with your parents. The episode opens with George talking to Jerry about having to move back in with his folks. Rob and Akiva pointed out how they really develop the Frank and Estelle Costanza characters this season. Kramer comes in talking about how George should just borrow money or move in with Jerry or him instead. In the next scene, George is moving his stuff into his parents’ house. After commenting on how much stuff George has, Estelle tries to get them all to eat bologna sandwiches, but is rebuffed strongly. Rob and Akiva talked at length about the decline in bologna’s popularity, wondering why so, when it is essentially the same thing as hot dogs. When Jerry and Kramer go to leave, George realizes the ramifications of having moved back in with his folks. Jerry and Elaine are out at dinner with Kramer and his new girlfriend Leslie, who is an extremely low talker. Throughout the dinner, Jerry and Elaine have to just nod along to what she says, ultimately leading to Jerry agreeing to wearing this ridiculous pirate like shirt she has designed on his upcoming appearance on The Today Show for a charity appearance that Elaine is heading up. While out to dinner with his parents, George is thwarting off suggestions from Estelle to take a civil service test while Frank simultaneously talks about his silver dollar collection. Fed up by all this, George decides to get away for a few minutes. As he’s walking away, he bumps into a woman who immediately notices he has great hands, telling him she is an agent for hand models and should call her. At Jerry’s apartment, George is showing Jerry his hands, but Jerry doesn’t see anything special. Kramer comes and pranks George with a joy buzzer, which causes George to panic so much that he puts on some oven mitts and walks out . After George leaves, Kramer tells Jerry how excited Leslie is that he will wear the puffy shirt on his Today appearance. Jerry realizes he inadvertently agreed to wear it when Leslie was low talking at the restaurant. He then utters the famous line, “I don’t want to be a pirate!”. The next day, George is manicuring his hands in his parents’ living room. Estelle is over the moon about it all, while Frank is cutting the idea down. She offers George some Jello, but Frank yells about there being fruit in it, while Estelle yells that George likes the bananas. George scolds them, saying the stress is bad for the epidermis, and decides to take the Jello to his room. In the green room at The Today Show, Kramer is there smoking a cigar while Jerry laments wearing the puffy shirt. When Elaine comes in, she laughs at the shirt, then panics when she realizes Jerry agreed to wear it on the show. Meanwhile, George is on set for his first hand model shoot, where they are all telling him his hands are some of the best they’ve ever seen. When Jerry sits down with Bryant Gumbel, Bryant can’t get to the interview about the charity as he is in hysterics over the puffy shirt. Jerry gets quite defensive, revealing that he had no idea he agreed to wear this ridiculous shirt. As he says it, we hear Leslie offstage scream about him slamming the shirt. Back with George at the photo shoot, a woman on set is really taken with him because of his hands, and wants to date him. Back in the green room, Leslie the low talker is now screaming at Jerry for ruining her career. George comes in excited about the modeling, and when he notices the shirt, he starts laughing at Jerry. Leslie hears this and shoves George, who careens hands first into a hot iron, burning his hands, putting an end to his hand model career. Rob and Akiva debated why you would even need to iron a puffy shirt. At the diner, George has bandages on both hands, needing Elaine to feed him. Jerry is troubled because he is now hearing pirate themed heckles at all of his shows now. Elaine was subsequently fired from the charity due to Jerry’s appearance. Kramer shares that he broke it off with Leslie because he can’t be with someone who’s life in shambles. Lastly, we learn that the puffy shirts have all been donated to the homeless. Jerry’s closing standup is a bit about how to properly get someone to speak up. Rob shared his solution to the bologna conundrum. He thought that changing the name to American salami might help boost it’s popularity, to which Akiva was on board. Rob and Akiva both agreed this should be a high ranked episode, but not quite as good as “The Contest”. Akiva wasn’t as high on it as Rob, but he did rank it 27. In 2015, not much would be different about this episode, but Akiva did think clothing nowadays are more unique, allowing for someone to wear a puffy shirt with less commotion. There were a few emails this week. First, Travis had a comment about Jerry’s hair being more puffy than the shirt, and that Kramer moved the fad of the 90s from Hammer time to pirate time. Next, Craig wanted to know if either of them have body parts worthy of modeling. Though Akiva’s been told he has great elbows, neither felt they could be any type of model. Craig also pointed out that the puffy shirt used to be on display at the Smithsonian. Johnny De Silveira emailed in wondering why Jerry felt so obligated to go through with wearing the puffy shirt. Amir points out that Estelle is seen several times laughing or giggling throughout the series. He also thinks the puffy shirt would be crazy enough to become fashionable today. Lastly, Chester points out how Jerry falsely claims his dad doesn’t throw anything out, but he threw out the Velcro wallet last season. He also noted how George says Jerry doesn’t let anyone even use the bathroom, yet everyone seems to use his bathroom frequently. Lastly, he wondered why they convened at a different coffee shop at the end of the episode. Rob and Akiva thought perhaps they were working on the Monk’s set. Tune in next week as the guys will recap “The Glasses”. Send in your questions by emailing [email protected]. Don’t forget to subscribe to the podcast by going to postshowrecaps.com/seinfeldITunes where you can rate and review the podcast. You can get a discussion going about the podcast by leaving a comment on the show page, and as always, you can follow them on Twitter @robcesternino and @keev26.